So, because I love the recipe so much, I wrote about it in my column a couple of years back, then went looking for the recipe on this site, because the recipe card is worn to the point of not being so readable. And so, I discovered that this recipe, perhaps one of my all-time favorites, is nowhere to be found on this site. One can Google it, one can search for it in the newspaper’s archives, or one could come over here and try to decipher the recipe card. Or one could read it right now. Here. Where it ought to be. This is beef stew. Simple, straightforward, and oh, so yummy, that it is likely to become your go-to beef stew recipe of all times. But because we don’t eat red meat around here any more, I’ve adapted the recipe to our own liking, using chicken thighs instead of beef. Weird, huh? Okay, let’s call it chicken-thigh stew. But it’s so hearty that you’ll think of it as beef stew with a difference. So what I’m going to do here is to re-publish the column I wrote for the paper, and let you see the whole reconstruction plan. If you want the real beef stew recipe, read through the column to the end, or skip to the bottom for the original. Either way, it’s a winner. Posted: Sunday, January 9, 2011 12:06 am | Updated: 11:59 pm, Wed Sep 11, 2013. It’s just a little tin box. You probably have one in your kitchen. But oh, the treasures inside. The box, adorned with homey images from a simpler time, is stuffed full of 3×5 index cards that Ellen got from her mother. On these cards – faded with age, occasionally smudged with gravy, handwriting made gauzy by the heat and humidity of a working kitchen – is a treasury of recipes collected over decades from friends and family and handed down from generation to generation. The box contains an amazing range of tastes – from “Adele’s Cereal” to “Ham, Cheese, and Potato Casserole,” to “Porcupine Meat Balls” to “Zucchini Chocolate Cake”. Many of the recipes are from that simpler time, when “fat” was what “healthy” babies were, and when the family cook had most of the day to plan and execute the evening meal, including a loaf of fresh-baked bread. That’s why this particular recipe caught my eye, and eventually my fancy. It reminded me of meals from my childhood. 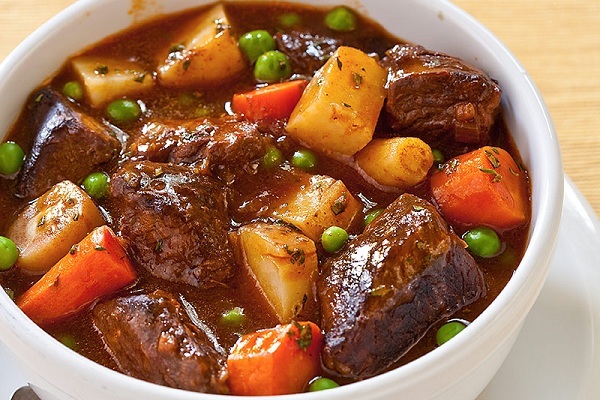 It was called “Marge Mason Stew.” My mother-in-law’s neighbor many years ago, Marge had created the perfect beef stew recipe – comfort-food good, and very simple. But more to the point, it can be adapted to almost any taste, including for folks who don’t eat red meat, like my family. Having made, and played with, the recipe dozens of times, I now use turkey or chicken thigh meat as a replacement for fatty beef cubes. 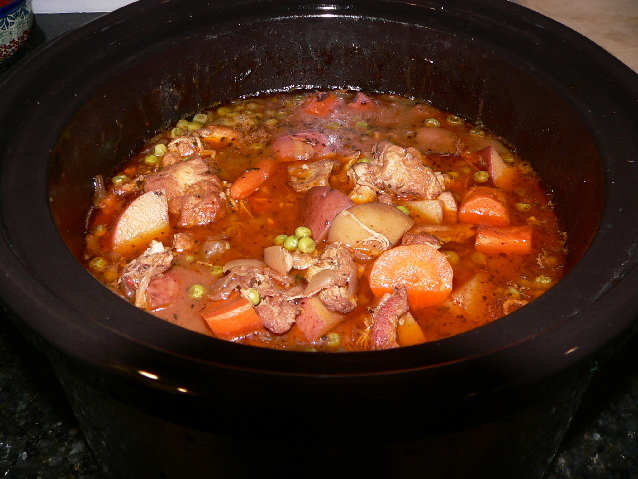 This produces a stew that is almost identical in flavor and texture to beef stew, lower in fat and totally satisfying. And in a busy world, this recipe is perfect for a slow cooker. Preheat oil in a large heavy pot over medium-high heat. Reduce vegetable broth in a saucepan until only 1 cup remains. Place the flour, salt, pepper and ginger in a large food-storage bag, shake well, then add half the turkey cubes to the bag. Close the bag, and shake well until the turkey cubes are coated with the flour mixture. Place the flour-coated cubes into the pot and stir until they are fully browned and firm to the touch, about 10 minutes. Remove the meat cubes to a bowl. Repeat with the remaining meat, adding more oil if necessary. Return the original batch to the pot, add the garlic and stir for 30 seconds. Then add the broth, and 1/2 cup of wine, bring to a boil, and stir to deglaze the pot. Then add the meat, herbs, and ketchup. Simmer for 1 1/2 hours. Add the onions, carrots, potatoes and remaining wine. Add salt and pepper to taste. Simmer for an additional hour, adding the peas in the last 15 minutes. Serve when the potatoes are tender. To make this stew in a slow cooker, brown the meat in a heavy pan, deglaze the pan with the wine, place the meat and the glaze in the crock, cover with the remaining ingredients, and cook on the low setting for 8 hours. Also, double the recipe. It gets better in the fridge. Add the consomme and garlic to the pot and simmer, stirring to remove the brown bits from the bottom of the pot. Then add the browned meat, 1/2 cup wine, herbs, tomato paste, and ketchup, and stir well to mix. Simmer for 1.5 hours. Add the onions, carrots, potatoes and the remaining wine. Taste and salt and pepper to taste. Cook for another hour. I’ve been asked on numerous occasions to post a killer kugel recipe. Okay. It being Passover and all, it only seems right that I put out there the kugel I’m making for this year’s holiday. I found this recipe online, and adjusted it to my personal liking. I’m making two this year, our pal Marcy being at less than 100 percent, and what could be better for a great friend than making her a kugel? Not much that I can think of. Mince the parsley to a coarse consistency; then place in a large mixing bowl. Halve, then slice the onions about a half-inch thick; Heat a large enamel-coated saute pan, add 2 tbsp butter and 2 tbsp olive oil, and add three onions and the paprika over medium-low heat them). Grate the remaining onion and the carrot through the fine holes on a box grater, then place in the large bowl. Add the parsley, eggs, salt and pepper and mix well. Peel the potatoes and place in bowl of cold water until you are ready to shred them. Don’t shred them until the onions are all caramelized. If it looks like it will take a while for the onions to finish, put the covered mixing bowl in the fridge. When the onions are browned, set them aside to cool. Preheat the oven to 375 degrees F. Shred the potatoes in a food processor or a box grater and immediately mix with the other ingredients. Add the matzo meal, baking powder, caramelized onions and the remaining olive oil and mix thoroughly. Spray two 8×8 or 9×9 baking dishes with olive oil spray; scoop in the mixture, smoothing off the top, and drizzle the tops with a bit more olive oil. Bake for at least 75 minutes or until the tops are brown and crisp on top. If making ahead, remove from oven while it is still very light brown (about 1 hour). Allow to cool, cover with aluminum foil and refrigerate. To reheat the next day, bake, covered for 30 minutes, then remove the cover and continue baking until the top is brown and crispy. Serve hot with applesauce on the side. NOTE: Onion-infused olive oil is a marvelous product. To make it, saute an onion in olive oil, stirring frequently, over medium heat until totally transparent and just beginning to brown. Remove from the heat and allow to cool until just slightly warm. Add two cups of extra-virgin olive oil to the pan, cover and allow to sit for one hour. Strain the olive oil to remove all the solids and store covered in a dark place until ready to use.